With characters as colorful as the gorgeous 3D scenescapes surrounding them, and words as wonderfully witty as one can write, acclaimed musician and librettist Doctor Noize’s first illustrated children’s book has brought joy and togetherness to many families. This cartoon-colored Odyssey shows how Phineas learns about other creatures’ love of music… as he realizes we each have a song to contribute to the great symphony of life. There once was a monkey — McBoof was his name. 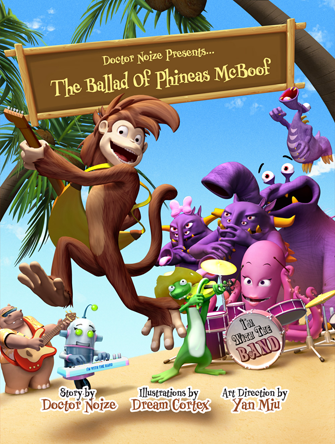 So starts the journey of the great enigmatic monkey, Phineas McBoof, as he fleetingly flees fame and fortune to find philosophy and form his fantastic new band, The International Band Of Misunderstood Geniuses. Take an adventure with rugged individualists like Backbone The Octopus, Bottomus The Hip Popotamus, Riley The Robot, Lenny Long Tail, and The Ooh Gah Boo Gus as they travel the world with one thing in common: They groove to their own music. So come join The Band to find your own inner genius. With colorful characters brought to life by the storytelling of Doctor Noize and the three dimensional magic of Dream Cortex and Artistic Director Yan Miu, this book tells the same tale as Doctor Noize’s beloved recording of the same name, with its #1 national hit song Banana. Also available in a stunning and sonically interactive Ebook App.